Another ten cards down, one more month to go and I will have 50 cards ready for the holidays. Actually, I will have more cards than that as I’ve dabbled in a couple of other designs throughout this time, so I will probably have somewhere in the vicinity of 70 cards when all is said and done. 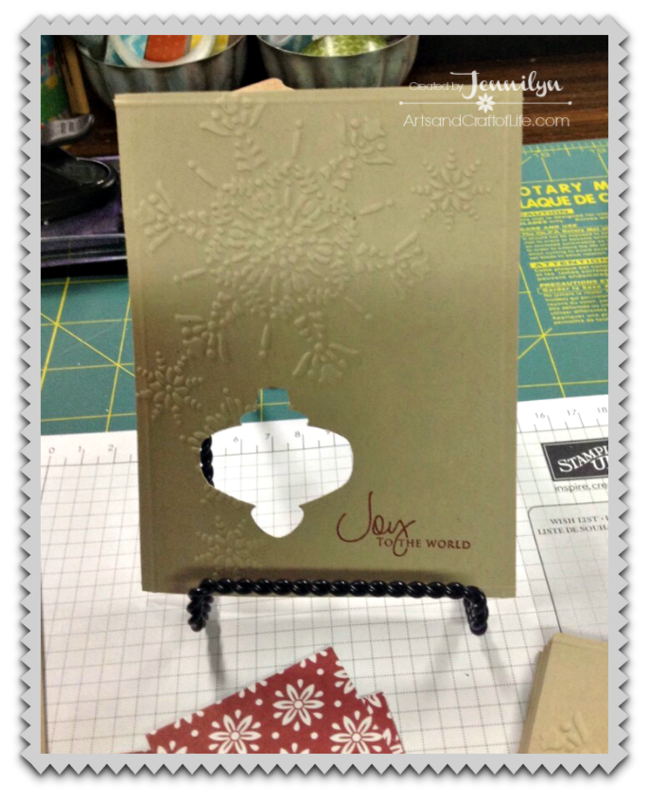 And, with all of this early prep I’ve done, and then the new Stampin’ Up! Holiday catalog. UGH!!!! I’m going to go broke. I used the same method this month as I have the others, inspiration from one of my video and blog hoppin’ discovery sessions I have on Sunday mornings. In fact, this is the second time I’ve used inspiration from Catherine Pooler’s website for my holiday card series. What attracted me to this card was it’s simplicity. 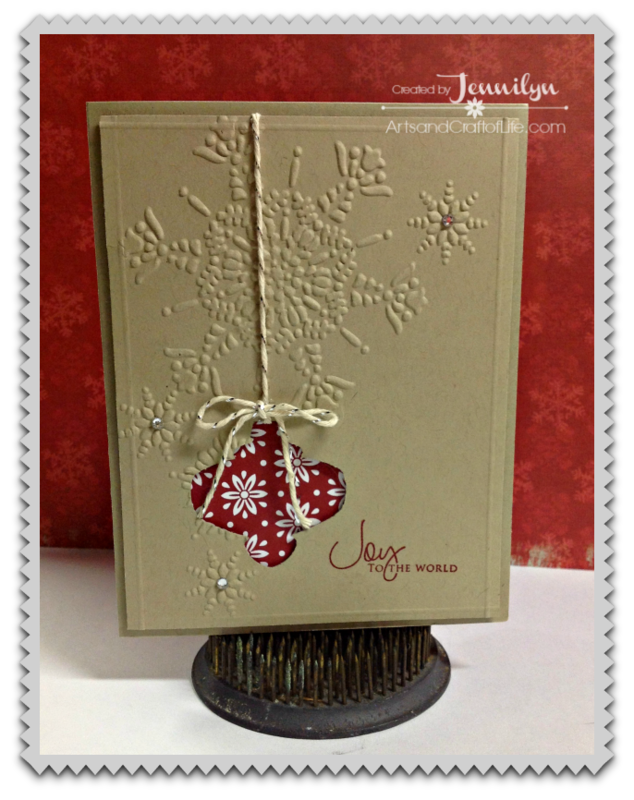 But as in any month and any CASE card I use, I like to put my own spin on things and change it up just a little, so I grabbed my basic supplies to mimic Catherine’s card – crumb cake cardstock, ornament punch, some designer series paper and baker’s twine. 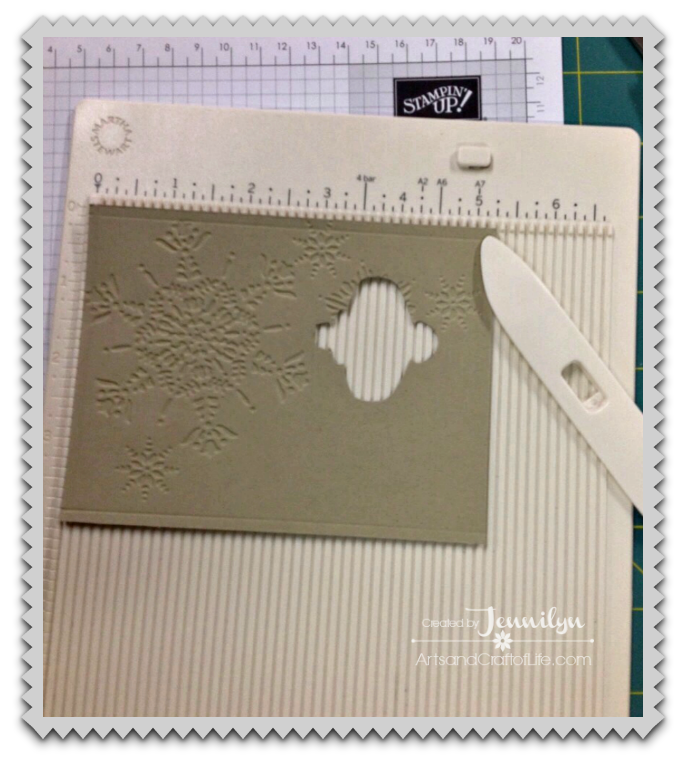 But then I got to thinking to myself, I’m a background girl, I need something in the background but I didn’t want a stamped background, so I dug out my embossing folders and chose the Stampin’ Up! snowflake one. I also decided to change the position of the card from landscape to a portrait layout. 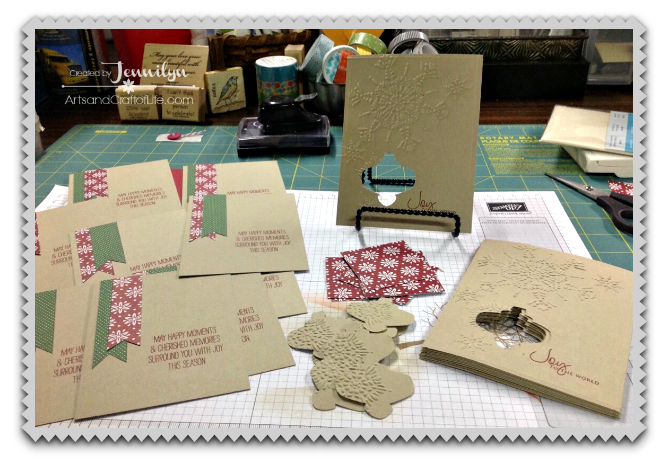 Once I gathered all my supplies I got down to business and started, cutting, embossing, punching, scoring and stamping my collection of holiday cards. Then I moved onto the inside. Here I used a 3/4″ x 6″ strip of designer series paper cut in half to make my banner flags. Take the reverse image from the punch out ornament of the front layer to pop onto the banner flags inside. Stamp a holiday greeting and then layer the finished crumb cake piece onto a cherry cobbler layer before attaching it to the inside of the card. Once all the inside layers was completed, it was time to put it all together assembly line fashion. The final touches included silver bakers twine for the ornament to hang, topped with a bow and three twinkling rhinestones in the centers of the small snowflakes. And, finally don’t forget to sign your creation on the back. Ten more cards in the history books, one more month to go. 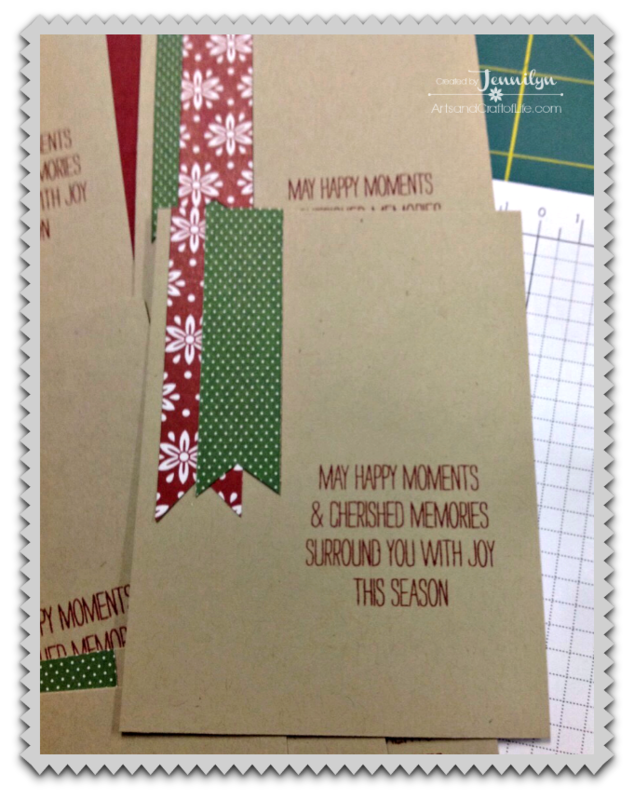 See you back here on September 25th for my last Monthly Holiday Card Stash series. I hope you’ve started creating your holiday cards by now, Christmas is right around the corner now that the kiddos are all heading back to school and football season is upon us. Stampin’ Supplies ~ Stamps: PTI Signature Christmas, SU Wonderous Wreath; Cardstock/Ink: Crumb Cake, Cherry Cobbler c/s, Trim the Tree DSP paper stack and cherry cobbler ink; Accessories: SU ornament punch, SU snowflake embossing folder, silver baker’s twine, rhinestones, white floss, dimensionals and glue dots.